A couple of weeks ago I saw Kung Fu Panda 2. Having enjoyed the first Kung Fu Panda movie as a light children’s movie, I was surprised by the depth of the messages in the sequel. Though still a nice children’s movie, I walked away with several key ideas that are worth remembering. Just to give a short summary of the movie, the main character is a large Panda named Po, who was raised by a goose (only in movies can this happen!). 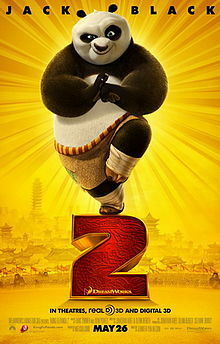 The panda is devoted to his ‘father’, a goose that runs a Chinese noodle restaurant. In the first movie we see how the Panda becomes a Dragon Warrior and in the sequel he continues to use his Kung Fu prowess, with 5 other Kung Fu masters, all different animals. In Kung Fu 2 Po learns that the goose is not his real father (shock!) and sets out to find out who his real father is. Of course the journey takes him far from home and he has to risk everything to face the mean opponent who killed the Panda clan years earlier. Many mythic hero stories have the hero venture far from home to face a life threatening ordeal and an evil opponent to battle in the classic good vs. evil story line. Most heros have been abandoned or lost their parents when they were young (think Harry Potter). And in all these classic tales the hero must face his/her own inner demons to find his/her real powers and inner strength to defeat the opponent. Let’s see how this story can provide lessons for your work. A major lesson in these hero stories is that our victory isn’t over an outside other entity, not from a spiritual sense. The ‘enemy’ is merely a prop or actor for the story line. No, it is a victory over our own inner dragons that is the real story. It is an inner quest to discover your true destiny, your inner strength, and connect with the Source of your being. The Panda learns an important herioc lesson from his mentor, Master Shifu, (I’m not sure what type of animal he is but think Obi-Wan Kenobi or Dumbledore). This lesson is to still the mind (or in a similar vein, think of Luke Skywalker’s training to Let the Force Be With You). With a still mind, connecting to your Source, inner peace and clarity prevail. From here intuition, guidance, and your inner wisdom can emerge. This inner peace conquers doubts, worries, distractions, and obstacles by having them flow effortless around you. When the panda learns how to allow the rain drop to fall on him without breaking his concentration and inner peace, he uses the same practice to deflect the barbs and arrows (and cannon balls) that are shot at him. Again, let’s look at your workplace. Do you let everyone’s petty comments, judgments, grudges, insults annoy you and distract you from your work? Can you learn to let these go, in one ear and out the other, without staying attached or connected to the power and negative energy of them? When you learn to let others have their opinions and judgments, saying what they will without it disturbing your inner peace and concentration, you’ll learn the way of the Tao. The last lesson is a particularly good reminder even if you aren’t on a hero’s journey. Your history doesn’t determine your future. No matter what your background is, you now choose who you want to be and become. Even with the best schooling or family upbringing, success isn’t guaranteed. Nor is the worst family or school a set-up for failure. How you live your life, with what you have in front of you now, is what counts. So at work, even if you don’t have all the resources at your fingertips, or the training you need, or the extra support you’d like to have, how can you navigate your way through to achieve your goals? What’s been put on your desk today is your challenge and your future. How will you respond to that challenge? Will you take on a ‘poor-pity me’ role or will you step into your power and do what is yours now to do? How are your unique talents and gifts being called upon today in the work you are doing?